We're trained to be at jobs early. We need to wait for our clients. Our clients should never wait for us. And, when we have a bevy of inspections to do, we try to stack them together with a few minutes between them, to maximize the day. But, that doesn't always happen due to people's schedules. In both of these cases; you find that it doesn't take as long to get to a job as you planned or you have time in between inspections; there is "dead" time to fill. I always carry something to read with me. It can be my latest book or one of the magazines off the stack, but there is always something to read. In October, when we had the large number of inspections on one project, I managed to get through a book and a half, just in down time. Since I made most of the appointments and was doing most of the inspection work, I built lunch into my schedule. There was a Subway adjacent to the job site and I spent many lunches in a corner, reading the latest book from the stash. I'm still working through Terry Pratchett's Discworld series. I only got half-way through the chronological order of books so I have the rest to read this year. I love what is called the mass-market paperback size. It fits in camera bags. On one day, I found myself waiting on a supervisor to let me into the next set of buildings to inspect. 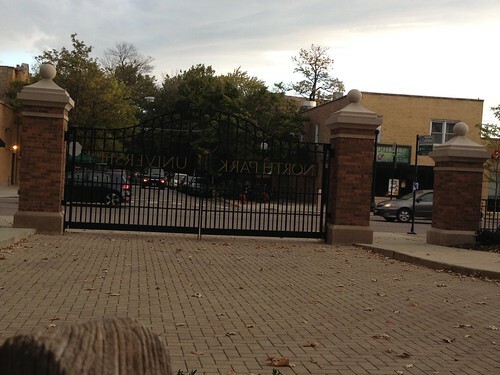 North Park University has a lovely area right in front of their main administrative building. There are benches around the area just inviting you to sit down and relax. The gentleman told me he was going to be about 30 minutes late and apologized profusely. "Not a problem," I said. "I can sit here and wait. The benches are comfortable." I don't remember which book this was, but it was the next one in order. I think I got close to 30 pages into the book before he was able to come get me for the next buildings. Getting lost in a good book can detach you from reality. I know this all too well. I've picked up the latest read and thought, "I have an hour. I'll just read the next 50 pages or so." The next thing I know, it's 3 hours later, I haven't eaten and the book is 3/4th finished. If you're not interrupted by anything, time evaporates into the pages. 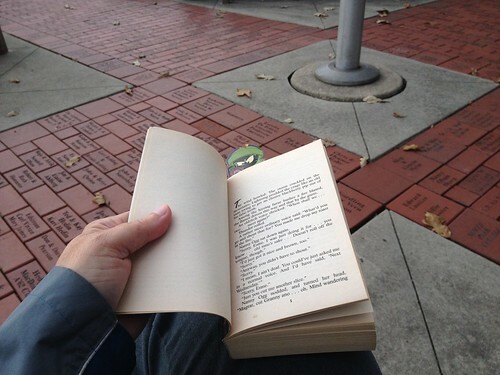 I love sitting outside and reading. Of course, there's nothing quite like having Pilchard in my lap when I'm reading, but the smell of fresh air and sunshine seems to make the novel's characters more alive. This day was overcast and devolved into heavy rain, but just being outside, in an inviting place for reading, lifted the mood of the whole day.